Angels in America is a 2003 HBO miniseries adapted from the Pulitzer Prize-winning play of the same name by Tony Kushner. Kushner adapted his original text for the screen, and Mike Nichols directed. Set in 1985, the film has at its core the story of two couples whose relationships dissolve amidst the backdrop of Reagan era politics, the spreading AIDS epidemic, and a rapidly changing social and political climate. HBO broadcast the film in various formats: two 3-hour chunks that correspond to "Millennium Approaches" and "Perestroika", as well as six 1-hour "chapters" that roughly correspond to an act or two of each of these plays; the first three chapters were initially broadcast on December 7, 2003 to international acclaim, with the final three chapters following. 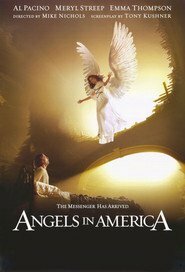 Angels in America was the most-watched made-for-cable film in 2003, garnering much critical acclaim and multiple Golden Globe and Emmy awards, among other numerous accolades. In 2006, Seattle Times listed the series amongst "Best of the filmed AIDS portrayals" on the occasion of the 25th anniversary of AIDS.